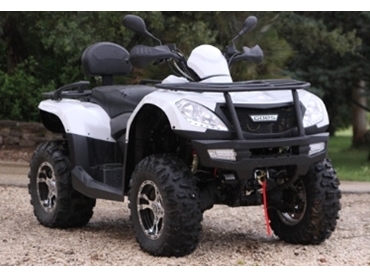 The G 625i MAX model of ATVs from GOES, a European company that specialises in the design, development and distribution of ATVs and other motorised products are available from Sportzwise . These ATVs feature a unique, modern shape and boast EFI technology, a 600 powerpack and a 4 stroke SOHC engine, which makes them incredibly powerful. For enhanced user comfort even after extended periods the ATVs are equipped with independent double A-arm front suspension. Gas shocks with pre-load adjustment also form part of the ATVs front and rear suspension, while independent double A-arm rear short absorbers work to ensure the ATVs operate in a smooth manner, even in challenging environments. With a towing capacity of 350kg, front rack weight of 35kg and rear rack weight of 70kg, these ATVs can be used to fulfil a range of different tasks across various different environments. Additionally, rear LED lights make the ATVs suitable for use in a range of different weather conditions.